What Are the Effects of OIG Exclusion? Organizations that bill Medicare, Medicaid and other federal healthcare programs should ideally check exclusion lists once a month after the initial hire. There are a few exceptions to the tight regulations surrounding screening. Essentially, an excluded individual can be employed if the provider is able to pay the individual exclusively with private funds, or from funds obtained by other non-federal funding sources (but this is a risky proposition, and isn’t recommended). Providers don’t have to maintain separate accounts to pay excluded individuals as long as they don’t submit claims to federal health care programs for the individual’s items or services. Payment from federal healthcare programs may not be received in any form by the excluded individual. The excluded individual and federal funds must never overlap even if finances end up in the same account. In these limited cases, the services or items furnished by the individual must not relate to federal health care programs or patients in federal health care programs. 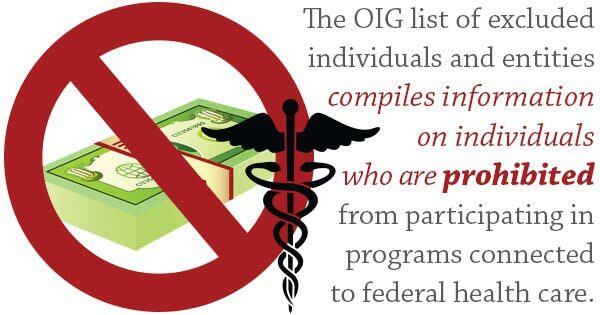 Health care providers who employ excluded individuals may still be able to avoid civil monetary penalty (CMP) liability as long as they can show that they’ve used a reliable staffing agency to check the OIG database for compliance for all other employees that the list can affect. Displaying good OIG screening practices can help an organization stay in the good graces of the OIG. The OIG has released several bulletins to help health care providers understand when employing an excluded individual could lead to CMP liability.